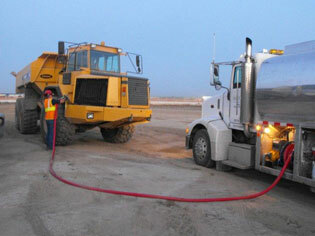 Fleet-Lube is a full service mobile refueling & equipment services company. We provide turn-key solutions for any contractor operating equipment for any scale project throughout the Dallas and Fort Worth Metroplex and all of North Texas. With our fleet of first class fuel and lube trucks we will service any project no matter the size or scope. We provide on and off road diesel fuel, a full line of premium petroleum products, all OEM approved filtration products and certified technicians to service your equipment on-site at your construction projects. Let our staff show you how we can make these services a reality to fuel and maintain your most valued assets. * Fleet-Lube has just been awarded two sections of the LBJ Express Project! * Fleet-Lube recently acquired another addition to its fleet with a new Freightliner 2000 gallon fuel lube truck! Fleet-Lube is your economical alternative to in-house refueling and preventive maintenance!